Gambler Jiko Chuushinha (ぎゅわんぶらあ自己中心派, Gambler Jiko Chuushinha? lit. 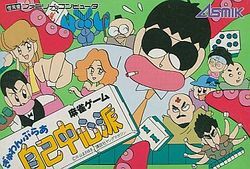 Gambler Self-Centered School) is a mahjong game based upon a manga license of the same name that was developed by Game Arts for the Famicom and the MSX, and published in Japan by Asmik towards the end of 1988. Being based on a manga, it has a large cast of characters from the comics that the player can choose to compete against. Beyond the manga license, it is very much still a mahjong game, focusing mostly on playing the tile-based board game, though using a difficult variation on the usual rules of the game, known as Reach Mahjong. This page was last edited on 27 December 2014, at 03:13.